Trigger Pull: The ASG Dan Wesson Pellet Revolvers have predictable triggers with the single action being a bit more consistent since the take up is short, and the release is fairly light. Double action mode is very usable without a lot of extra pressure required. I found I just wanted to shoot this gun in single action mode because it felt more natural being that it is a six shooter. You also want to take your time shooting since loading the pellets into each shell and then the shells into the cylinder takes a bit of time. Realism: The ASG Dan Wesson revolvers are as close as you can get to a real six shooter. Loading and ejecting actual shells into the cylinder makes you feel like this gun is much more than an unassuming airgun! 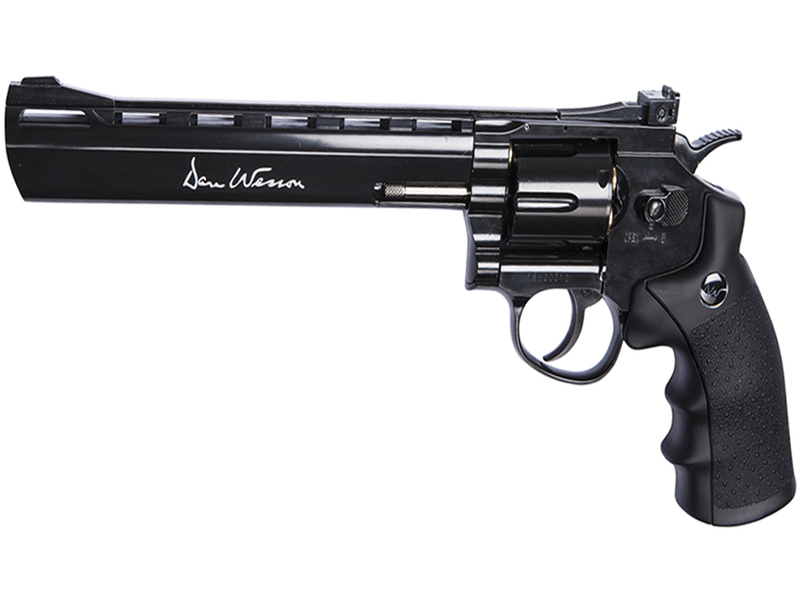 If you want that real revolver experience than a shell loading Dan Wesson is the way to go, and the addition of a rifled barrel and lead pellets to the Pellet firing version should make the shooting experience even better. Comments: Since I can't comment too much on the shooting experience these Pellet Dan Wessons will offer, I can say I am impressed with how ASG did the redesign of the inner barrel and pellet loading shells. It is obvious that ASG didn't just grab some parts of the shelf and quickly modify a BB version to shoot Pellets. ASG did it right and you can see the new adapted parts are of high quality and are even an improvement over the BB versions in many ways. On paper the Pellet shooting Dan Wesson's should be more accurate especially out at further ranges than the BB shooting Dan Wesson's and the Pellet versions should also hit the target with more force since they shoot a heavier projectile at around the same fps as the 4.5mm Steel BB version. 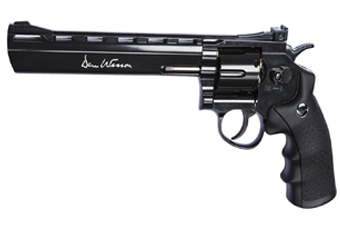 http://www.ReplicaAirguns.com - ASG Dan Wesson 6 inch Silver & 8 Inch Black Pellet Revolver Table Top Review. This video is a walkthrough review of the ASG Dan Wesson 6 inch Silver and 8 inch Gloss Black CO2 Pellet Revolvers. I show off these guns close up from all angles and point out the all metal construction and the incredible attention to realism these gun offer.